Vita Mass® HGH Booster was carefully designed to provide safe and effective means of naturally elevating one’s GH and IGF-1 levels. Vita Mass® HGH Boosterprovides precursor nutrients to help boost the body’s natural HGH levels a key to supporting the anti-aging process. Vita Mass® HGH Booster does not contain hormones and is a safe, sensible, cost-effective approach to supporting a younger you and embarking on a path to wellness and longevity. Doctors and Health Care Professionals worldwide now believe that increasing your levels of human growth hormone may facilitate improved health, fitness, energy, permanent weight loss, sports and workout performance, bring other hormones into normal ranges and so much more!. Human Growth Hormone (HGH) helps restore skin thickness, elasticity, smoothing out wrinkles and rejuvenating hair and nails. It promotes the burning of fat by making it available to the body as fuel while increasing muscle mass. HGH also helps enhance sexual function in both men and women. HGH revitalizes the immune system, assists in reducing the risk of heart disease by lowering blood pressure and improving blood cholesterol profiles. HGH improves oxygen uptake and may assist in helping prevent osteoporosis. 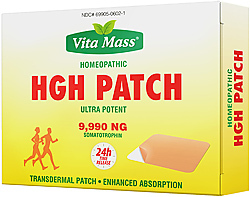 HGH helps weight loss and revitalized gland functions. HGH supports better and restful sleep. Studies show that ornithine alpha-ketoglutaric acid can enhance protein utilization and synthesis, improve glucose tolerance and stimulate aerobic metabolism. 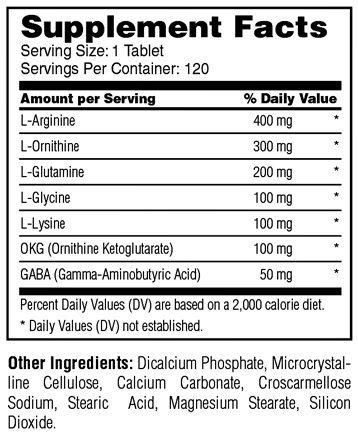 Adults, take (1) tablet daily on an empty stomach, between meals, or as directed by a health care professional.